"Oh she looks so perfect every week when she comes to Kindermusik class and I look like a slob." "Oh I love your hair! Who does it? It's just what I want. I hate my hair." We get comments like that all the time in our conversations and we are comparing ourselves to other parents, we're comparing our children to other children, oh my goodness, we compare where we vacation, we compare what restaurants we eat out in. I call this the Martha Stewart effect. What happens is Ms. Martha Stewart, the grand dame of perfection, she cooks perfect meals, she entertains perfectly, her garden is gorgeous, her home decorating is just so beautiful and everything she puts across in her media, on her television, on her social media pages, in her magazine, is always perfect to the point where she is teaching you how to do things so beautifully that we should be able to do everything perfectly, right? Well that's really not the case with the majority of us. I know I do many things as what I call "fails". I think in this day and age of social media, Instagram, Snapchat, Facebook, how many times do you take a selfie of yourself and then you take six of them and then edit it and then perfect it, and pick the one where you look the best before you put it on Facebook so that all of your friends can see how happy and beautiful you are? Well, this isn't reality, is it? How many of you see your friends on vacations and they post the most gorgeous photos of a location and the family is all smiling and looking wonderful and perfect and you think, "Oh my goodness, they're on this perfect family vacation and they're so happy, and the location is so beautiful." Well, I guarantee you it took about 12 photos until they got the one they wanted. So what's happening is, life that is not ours is looking perfect and then we turn around and look at our house and we see the toys thrown in the corner, the floor, and there's food on the kitchen floor and my hair is dirty, I haven't washed it in four days, and our life doesn't look so perfect compared to what we see on social media. This creates a lot of stress and can actually lead to depression because you start to feel like, I'm not good enough, I'm not the parent I need to be. I'm not the mommy I need to be. I'm not the wife I need to be. I'm not the husband I need to be. I'm not the partner I need to be. Am I doing a good enough job at work? I don't know, because every single thing that gets posted online or conversations that I have, all of my friends and colleagues are posting perfection in my eyes and I am not feeling that I can measure up. So this, I have named this the Martha Stewart effect and I think that it's putting so much added pressure on us that I would like to give you all a challenge. Can you post a big fail? Post something such as the cake you made is a mess, the cookies you made got burnt, the dinner you made, it might taste great but it looks kind of sloppy on the plate, but who cares? Post something that just did not turn out the way you think it should and laugh about it and have a good time laughing, and I bet your friends will all love it and they'll start to post things too that aren't perfection. See if we can all do that this week and have some fun with it and see if it releases a little bit stress and a little bit of pressure. 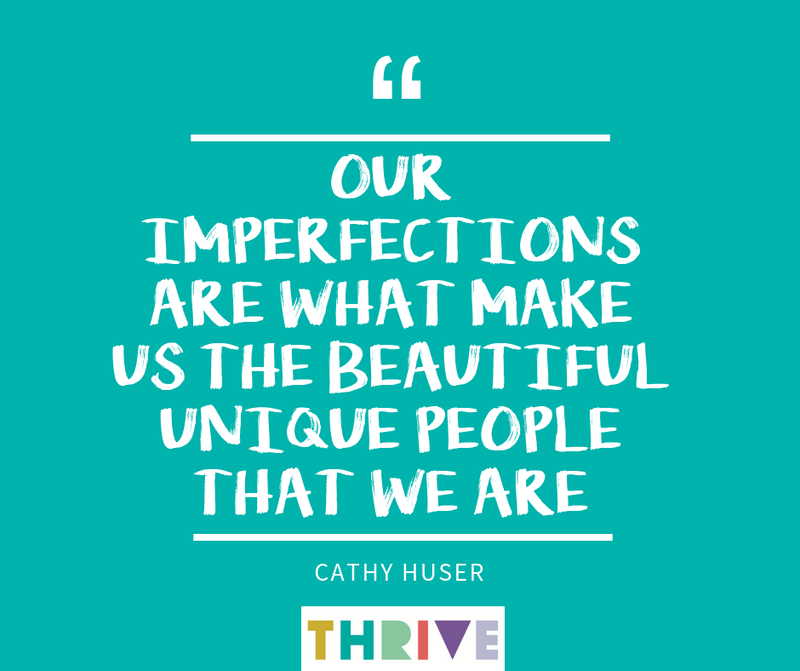 Let's share our imperfections, because honestly, there is no such thing as perfect. Our imperfections are what make us the beautiful unique people that we are, and lets have a little sense of humor about it. Let's talk about what is a natural happening everyday, how we naturally look, how my child naturally is running through the house spilling food and drink and throwing toys in places so that our house looks like a little bit of a playground or a gym or just a messy playroom. I want you to look at what you think you're frustrated at, take a deep breath, take three belly breaths to compose yourself, and say, "I get to be a parent. I get to mother or father or parent this child. I get to laugh at all the things that are happening during the day. I get to smile and laugh and love all of this. I'm not gonna measure up to anything but myself and who I love to be." I know it sounds simple, but actually its not so simple. So take an extra special moment and share with us something that you thought was a fail, but actually now you can look back and laugh on. Let us laugh with you, we're not going to laugh at you. Let's giggle and smile and enjoy all of life's imperfections because honestly there is no such thing as a perfect parent or a perfect child. We all are who we are and we should honor and love every moment of any type of catastrophe or what you might call a fail, or what you might call an imperfection, because we are going to love all of it.